I am not sure what I expected from Glasgow but good food wasn’t necessarily it, yet its what I got beginning with the excellent sea bass my first night. 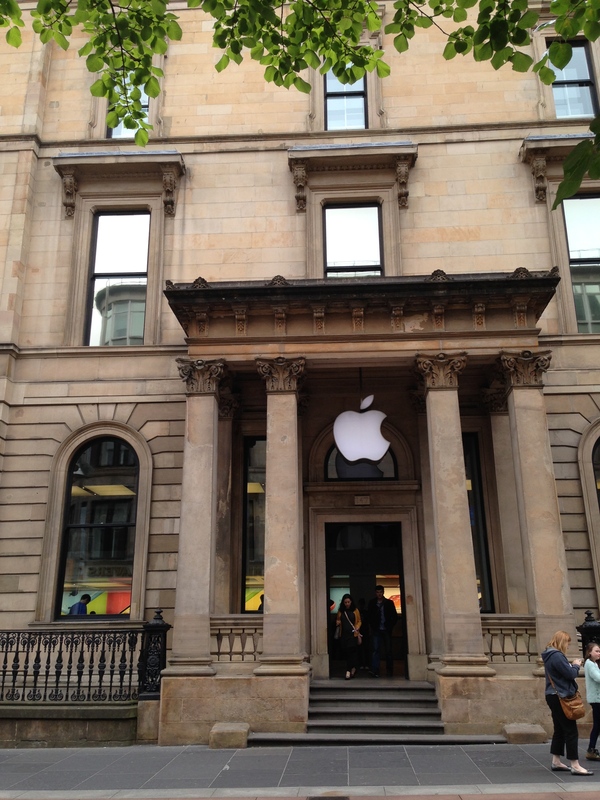 The next day, I made my way to Buchanan Street in search of an Apple store as my iPad went belly up or as it said on the screen “iPad disabled.” The store is an impressive Victorian building and the Ipad was put to rights quickly. I used this first day to get oriented, walking down the pedestrianized Buchanan Street, peeking down alleys at interesting looking pubs, exploring the Royal Exchange Square, and finally ending up at the Clyde River which has a promenade along the its banks reminiscent of the Seine in Paris. My one plan for the day was to visit the Center for Contemporary Art which I would pass on my way back to the hotel. The exhibit consisted of various forms of animation that switched from one screen to another in a long room strewn with hassocks. It didn’t captivate me; however, the café located in the center did interest me. It was a long room with tables, chairs, and banquettes along one wall. I was tired, hungry, and anxious to take up my blog now that my Ipad was fixed. The café offered free Wi-Fi and seemed ideal. It was. As I didn’t want to spoil my appetite for dinner, I ordered a warm kale salad. “Oh, that’s very small,” the waitress assured me. “You should order another dish.” I figured she knew best, so I added root vegetable fries. She was wrong. The salad was large and delicious with garlic and ginger lingering on the palate. However, the root vegetable fries of turnips and beets were another happy surprise. The bigger surprise to me, a dedicated carnivore, was that the café is a vegan restaurant which can hold it’s own against any fine eateries. 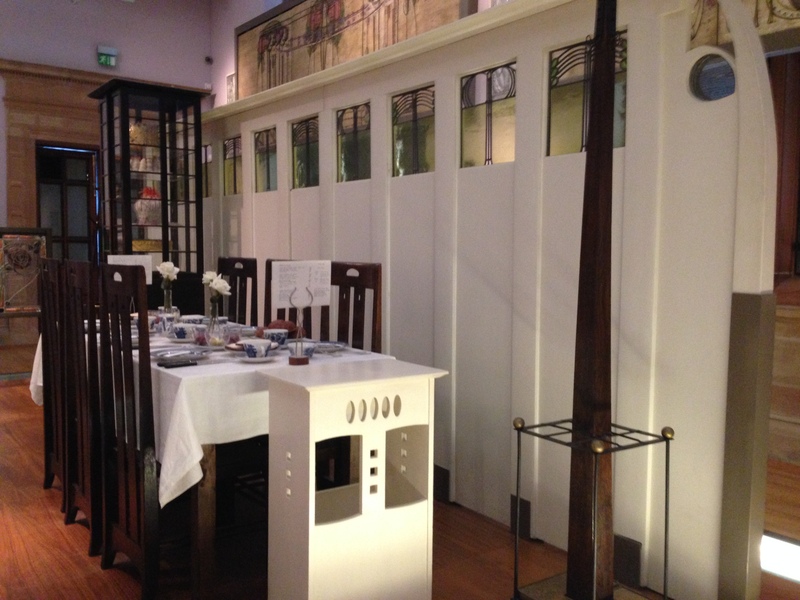 My last stop before was the Willow Tea Room designed by Glasgow’s renowned architect, Charles Rennie Mackintosh, known for his arts and craft and art nouveau association. At the time, I didn’t know of its fame. I just liked the way it looked. I ended my second day in Glasgow eating at a well-respected restaurant called The Sisters, an interesting experience in contrasts. Reviews of the restaurant declared it was the “best restaurant in Glasgow.” I put aside my jeans and Birkenstocks, donning a skirt and heels. I was dressed appropriately but was unprepared for the décor and the background music. The dining room was a study in l980’s elegance, all black and white. Although there were white tablecloths and silver place settings, the music demanded a disco ball. Throughout the meal, disco music hummed merrily in the background, irritating to eat by and at odds with the formality of the setting. I had no plan for my last day, but after a friend made me aware of Charles Rennie Mackintosh, I decided to devote my day to his accomplishments which I almost did. 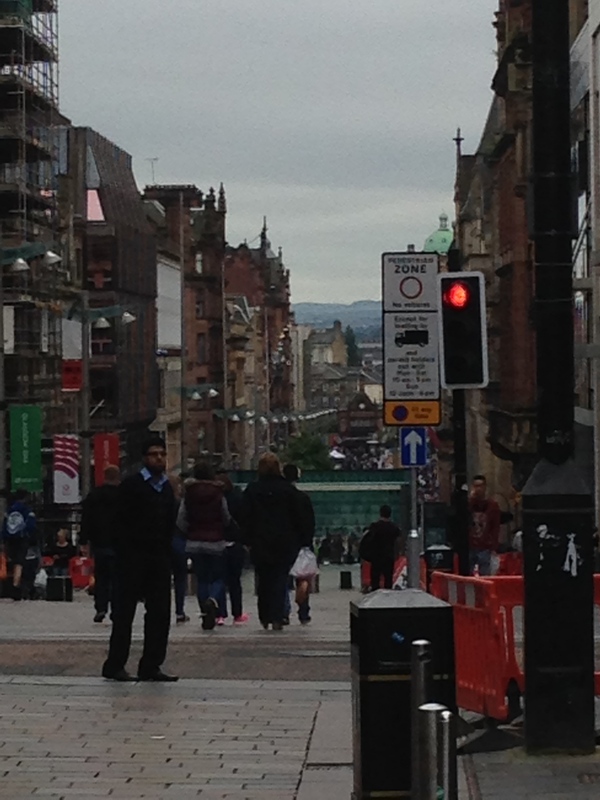 I visited the Glasgow Herald Building which he designed and is now a center for architecture with a tower that gives a panoramic view of the city; however, the staircase to the tower was closed. 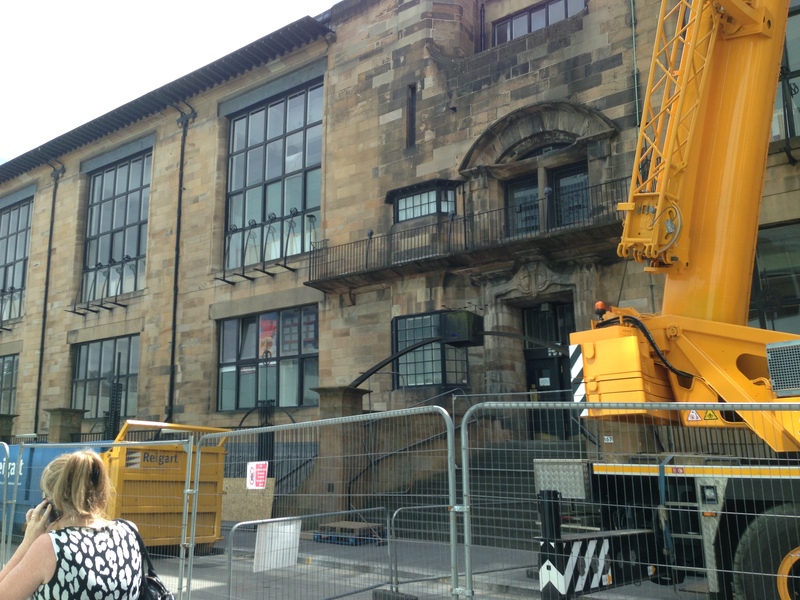 I made my way to another of the buildings he designed, the Glasgow School of Art: unfortunately, the front was covered in scaffolding. I had two more opportunities: the Mackintosh House recreated at the Hunterian Museum and Art Gallery at the University of Glasgow and an exhibit at the Kelvingrove Gallery and Art Museum. I spent too long at a second visit to the Willow Tea Room, swooning over replications of Mackintosh’s botanical watercolors. I had to have them. I couldn’t make up my mind which three to get as none of them seemed to fit together. Finally, I gave up as it was already 2:30. 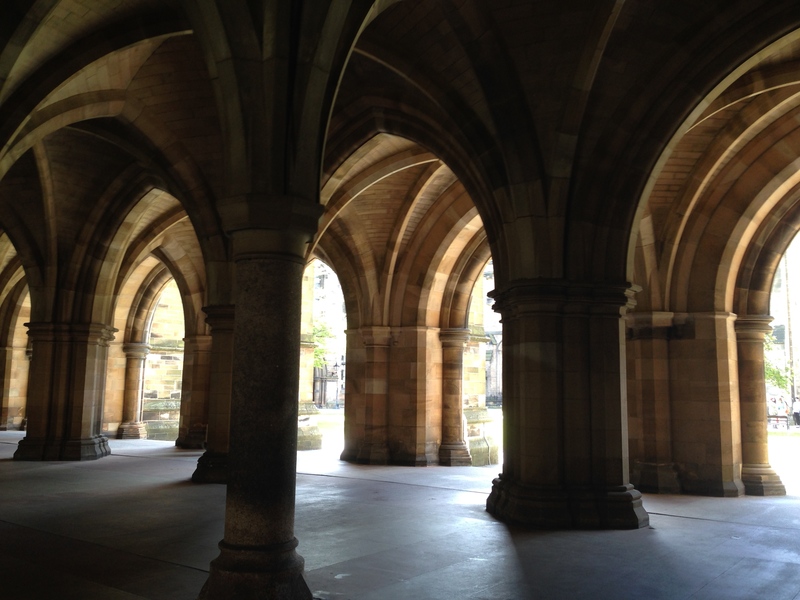 I sweated my way to the University of Glasgow and was immediately smitten. 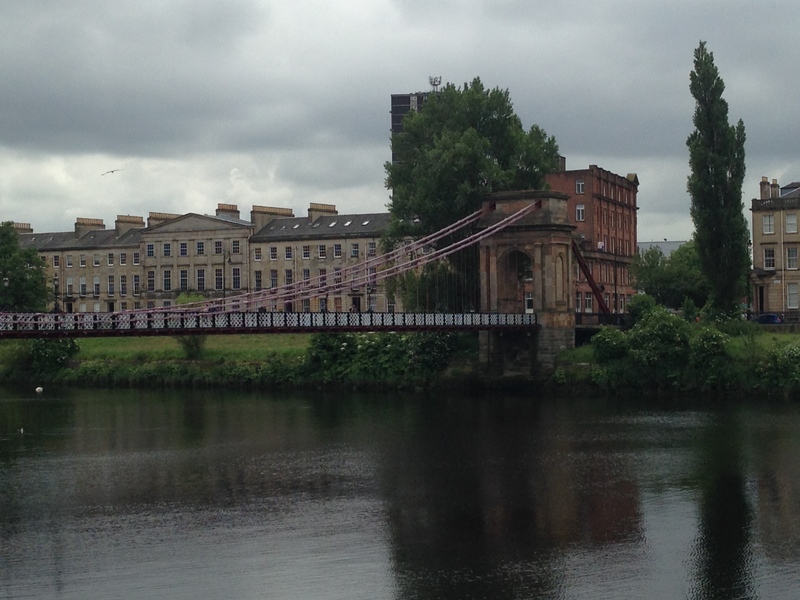 The buildings, the enclosures, the views over Glasgow were breathtaking. I forced myself to move inside and get to the museum. The door wouldn’t open. I said to the guard, “But it should be opened until 5.” He told me, “The museum is never open on Tuesdays.” Defeated again. By now, I didn’t think I could make it to the Kelvingrove Gallery and Art Museum, so I decided to go to Ashton Lane, recommended by my taxi driver as a street that hadn’t changed in 200 years. It, too, was within the boundaries of the university. Perhaps it hadn’t essentially changed, but like many restored areas I encountered including the Royal Exchange Square, it worked mostly as an opportunity to eat and drink. The tops of the buildings hinted at history. The bottoms were filled with cafes, pubs, and students drinking. 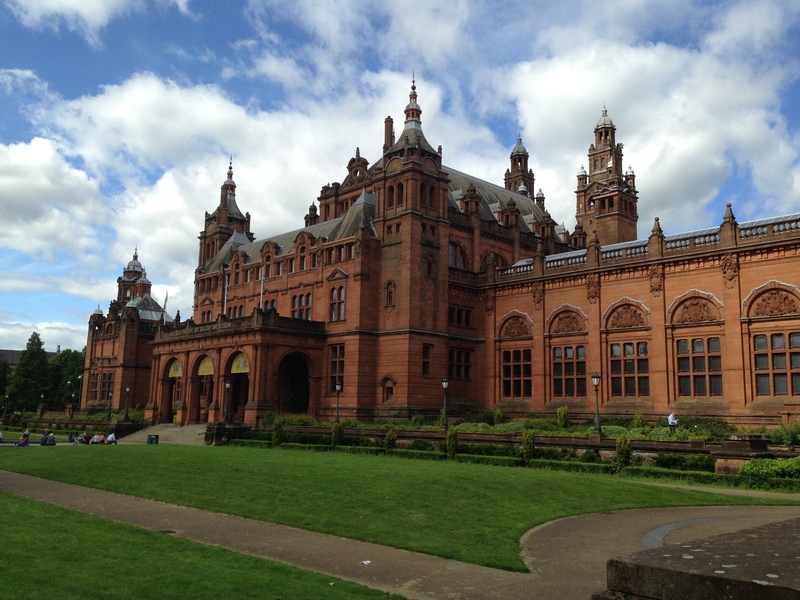 I turned away, walked past the University, down the hill through the Kelvingrove Park, and realized I had a half hour to spend at the Kelvingrove Gallery and Art Museum. Having a limited time in such a vast institution was liberating. I made my way to the rooms devoted to Mackintosh in time to see recreations of the Willow Tea Room and excellent arts and crafts furniture he created. After a hectic and mostly unsuccessful afternoon, I wanted a leisurely meal. As I did for the rest of my trip, I limited myself to restaurants that were within walking distance of my hotel. Two blocks from my hotel was a tapas style restaurant, The Ox and the Finch. I had a good seat with a view outside as dusk set in; the street was lit in a golden pink reflecting off the brick buildings. The atmosphere pleased me and would have been good enough; however, the food surpassed my expectations. With a glass of peaty whiskey know as “old salty” straight from the barrel, I had a bowl of large green olives, more than I could finish. Lemon orzo with broad beans and courgette followed. The orzo had bite to it, lemon infused the pasta but didn’t dominate, and the broad beans’ nuttiness complemented the dish. I finished with bass that was firm and sweet like Glasgow, like Mackintosh.